Writtem through the contribution of numerous sound designers, this book is the reference text for all those who compose or are interested in composing music through Csound, the software developed in the mid-eighties by Barry Vercoe at M.I.T. Csound is still a professional computer tool, with great performance and almost unlimited possibilities, improved by constant updates and developments of new utilities. In addition to excellent technical features (note that also works in real time), what makes Csound a instrument particularly suited to those who are starting to become interested in computer music, there is also its free availability on the official website www.csounds.com . 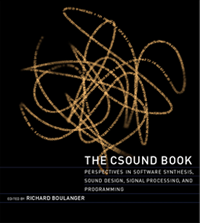 The subtitle (perspectives in software synthesis, sound design, signal processing, and programming) shows how the use of Csound is tackled from multiple points of view. The whole book is organized into two main sections: the first is devoted to the various synthesis techniques (introduced by nearly 150 pages that explain the use of software), while the second deals with the sound processing. The first chapter (Introduction to Sound Design in csound by Richard Boulanger) can be found in HTML version on the official website of Csound, together with the introduction by Max Mathews and with the preface by Barry Vercoe. The basic introduction to the software makes this book suitable even for the novice users, which will start from basics before you get to complex topics that will allow the construction of more interesting instruments. As regards the synthesis techniques treated, we remember the Frequency Modulation, the classic Additive and Subtractive, Granular synthesis, then the Ring Modulation, Waveshaping, FOF and FOG and other techniques based on mathematical models. This is a very rich section that can be summarized in the index. Equally rich is the sound processing section. It deals with topics relating to reverberation, spatialization (even 3D), chorus, delay, use of the Phase Vocoder and other: for more details refer to the index. The book closes with a section dedicated to the Csound programming, suitable only for those who are interested in improving the software with new opcode or various kinds of utilities. In the Appendix you can find a summary of the opcodes used in the book, with its syntax, and useful conversion tables. We must note, finally, the presence of two CD-Rom that contribute to make this book a reference tool both for novice users, as we have said, and for those more experienced. The pdf contains a summary of all CD’scontent: by articles dedicated to specific topics to music composed by this powerful software. On web i found the HTML version of the first CD, fully consultable. Do not forget, finally, that in addition to this book, absolutely complete from every point of view, for those interested in Csound was written The Virtual Sound, by Riccardo Bianchini and Alessandro Cipriani, available both in English and Italian.